Favoriting and later accessing data sources is very similar to favoriting workbooks and views. You can favorite a data source from the list view under Content by clicking the star. You can also favorite it from the data-source page itself. Note that only published data sources can be marked as favorite. You cannot favorite embedded data sources as they are not reusable. You can always mark the workbook containing the embedded data source as favorite and refer to it that way. Once you mark your favorite data sources, they’ll show up in the same familiar places where you see your favorite workbooks and views. 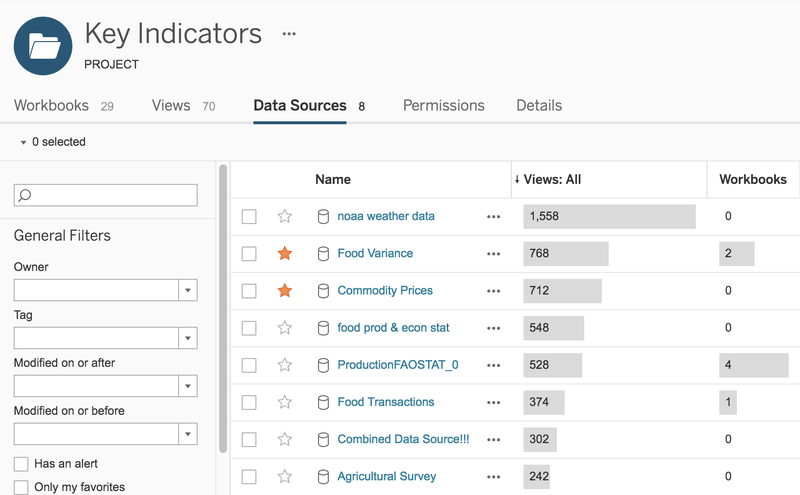 Click the star in the top bar from anywhere in Tableau Online or Tableau Server and you will see a list of your favorite workbooks, views, and data sources. You can filter the data sources to see only your favorites in the data-source list view. In Tableau 10, we’ve made it easier to find the most popular data sources. After all, you probably want to favorite these data sources. 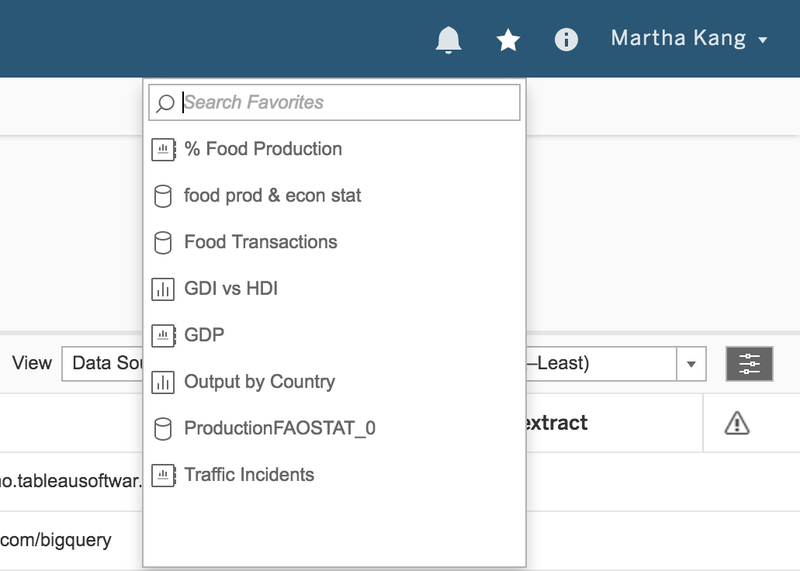 We now show the number of workbooks that connect to a particular data source in the list view. This has been a long-standing pain point as people had to click on each data source to find out how many workbooks connect to it. 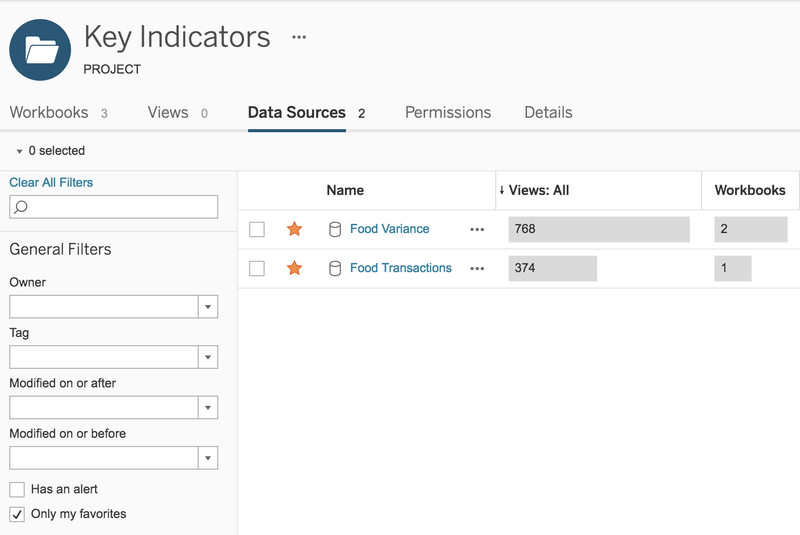 The second usage metrics we show in the list view is the number of views on a data source. This is simply the aggregate of the number of views on all workbooks connected to the data source. For the number of views, we have the ability to see all-time views as well as views in the last 12 months, three months, or one month. In addition to showing the number of views in the list view, we also show that information along with the number of favorites on the data-source page. These updates are to help authors find the right data source based on popularity. Data stewards and admins can also easily see which data sources are used the most and which ones can be cleaned out! We’ve improved the search-relevance formula for data sources with the usage metrics on data sources. 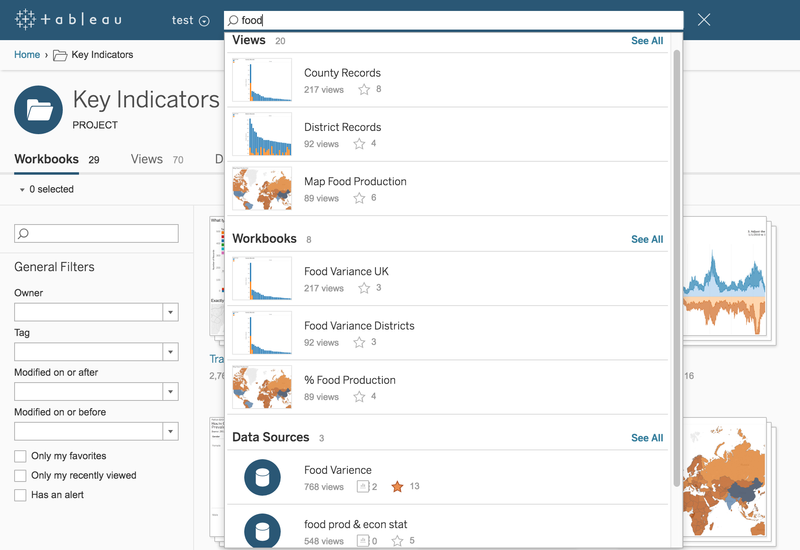 In Tableau 10, we are using a combination of metrics—number of views, number of connected workbooks, recent activity, favorites—to calculate a simple search-relevancy score. Our goal is to show the most relevant data sources higher in the search results. We’ve also made some UI updates to the search results. 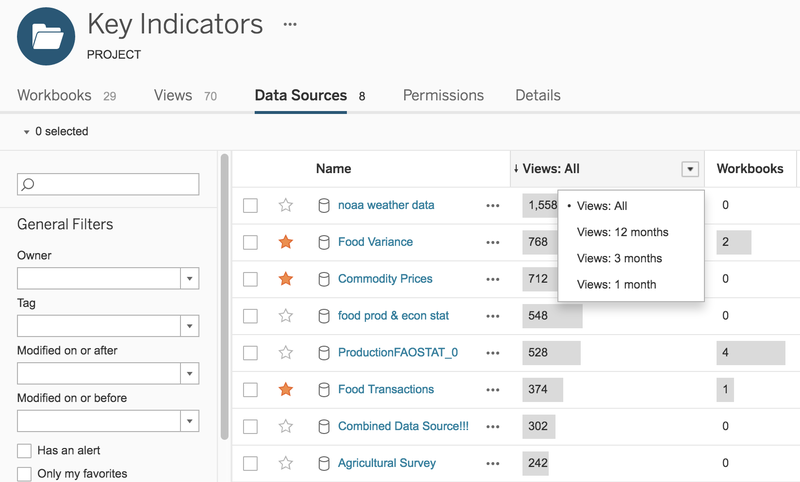 For data sources, we show the number of views, the number of connected workbooks as well as the favorites for the search result. This helps people determine the popularity and usage of a particular data source. We have a timeline for getting Tableau 10 out the door, but we’d first like to get solid usage in beta and fix any bugs. Please join the beta program and let us know what you think. Visit the Ideas Forum and tell us about content usage metrics that are important to you and your team. We'd also like to hear your ideas for features you'd like to see in Tableau. And if you have a question or feedback about the current functionality, please leave a comment below.